Canada publishes the first jobs report for 2019 after significant gains. While a drop in positions will not be shocking, the deceleration in wages is worrying. USD/CAD awaits the publication without a specific bias, allowing the report to have its full impact. Canada releases the jobs report for January on Friday, February 8th, at 13:30 GMT. Back in December, the nation reported an increase of 9.3K positions. While it was a modest number, it came on top of a whopping leap of 94.1K in November. The fact that there was no “payback” is certainly encouraging. This “payback” may come now, in the report for January. Any addition of jobs will, therefore, be seen as positive. The same logic goes for the unemployment rate. Canada enjoys a gradual slide that reached 5.6% in December. A bounce to 5.7% will not be devastating. The unemployment rate topped 7% back in 2015 and has been gradually falling. A minor setback is unlikely to impact the Canadian dollar. The jobless rate depends on the participation rate and that has risen from 65.2% to 65.4% in December. So the exact same logic applies here. Similar to the US Non-Farm Payrolls report, the Average Hourly Earnings gain more traction and carry more weight in impacting the currency. And here, the situation is not that optimistic. Annual Canadian wage growth accelerated early in the year and hit a high of 3.93% in May. Since then, things slowed down quite a bit. The bottom was in November with 1.46% and it only marginally increased to 1.49%. Bank of Canada Deputy Governor Carolyn Wilkins recently addressed the topic in a public appearance. She said that low wage growth means inflation has room to run. Her words gave additional importance to the publication. While official expectations are not available for this data point, markets will want to see a recovery towards at least 2%. 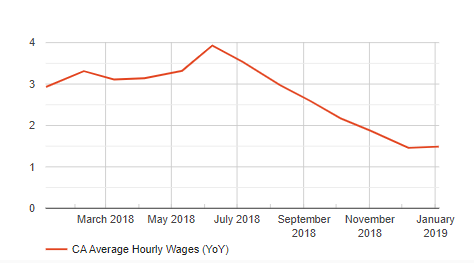 However, if salary growth remains depressed, the Canadian Dollar could struggle even if the nation posts another month of significant job gains. Canada’s labor market report is published one week after the US Non-Farm Payrolls figure. It gets the full stage to itself. Canadian housing starts are published 15 minutes ahead of jobs data but are of lesser importance. Where is the wind blowing? The answer is that the wind is not blowing in any direction at the moment. USD/CADdropped on the dovish Fed decision last week, but the impact has already run its course. Oil prices have also stabilized and so have stocks. Barring any last minute development on trade talks between the US and China, the employment figures are the sole movers of USD/CAD at this point. A drop in employment and a rise in the unemployment rate should not hurt the loonie too much after significant rises. However, markets and policymakers would like to see an acceleration in wage growth. Canada’s jobs report has the full stage to itself.